Vista Shutdown Timer is a practical, small and free automation tool that will let you shutdown, restart, or hibernate your machine at a specific hour. Vista Shutdown Timer is a practical, small and free automation tool that will let you Shutdown, restart, or hibernate your machine at a specific hour. The program is easy to configure and use, and it will display a text message or a sound before restarting or shutting down your machine. 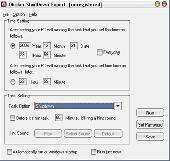 Vista-ShutdownTimer is an easy to use shtudown timer for Windows. Vista-ShutdownTimer is an easy to use shtudown timer for Windows. You can use this Timer with a PC-IR Remote control. Program allows scheduled shutdown, reboot and wakeup (Wake-On-LAN) computers on the local network. You can easy perform actions for any number of work stations. Program has a command line support, log files, etc. Vista System Optimizer is an utilities suite works on Windows Vista, With its comprehensive suite of utilities and attractive interface, Vista System Optimizer makes it easy to regularly clean and optimize your system for better performance. HSLAB Shutdown Folder is a program which provides a functionality, similar to the Windows "Startup" folder. It run on shutdown tasks, command files( *.Bat,*.Vbs,*.Cmd) and symbolic links placed into a "Shutdown Folder"
JOC Master Shutdown is a system utility for Win9x/NT/2000/XP that allows to automatically shutdown your computer, a remote computer or a complete LAN domain.